Army AL&T magazine is USAASC’s quarterly professional journal, comprising in-depth, analytically focused articles. The magazine’s mission is to instruct members of the Army AL&T community relative to AL&T processes, procedures, techniques and management philosophy and to disseminate other information pertinent to the professional development of workforce members and others engaged in AL&T activities. The magazine is available in both hard copy and on the USAASC website. 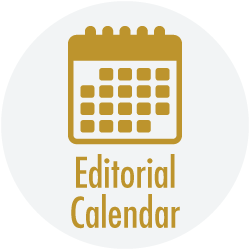 The editorial calendar shows the themes and deadlines of the current and future issues. Who can write for Army AL&T? Anyone in the Army Acquisition Workforce and its stakeholders can write for Army AL&T. We work with writers from all skill levels, including no skill. Our editors are that good. Articles must have an OPSEC review and a Functional Lead approval to ensure articles are aligned with current Assistant Secretary of the Army (Acquisition, Logistics and Technology) Priorities. With rare exceptions, Army AL&T does not publish articles that will have already been published in other publications or blogs before we go to press. Articles should be approximately 1600 words. Format per writers guidelines and submit in Word (.docx) form with a title that keys to the article name, for example, COL Smith Logistics Commentary. Each should be a separate, high-resolution image file in .jpg, .img, .png or .tiff format, minimum 2400 pixels wide—most often a file size of 3-4 MB or larger. Captions: Paste captions in the form provided on the submissions page. Alternately, submit captions in a separate Word document with the same title as the article. For example, COL Smith Logistics Commentary — Captions. Caption details: Include the who, what, where and when details, and the photographer’s or artist’s name and organization: (Photo/Illustration by Name, Organization). Graphics, figures and illustrations: Submit in PowerPoint format (.ppt or .pptx), pdfs or as image files (.jpg, .png or .tiff), or Photoshop or Illustrator. Advertisements: Must fit in the Army AL&T template and should consist of minimal text and a “call to action,” such as a phone number or website that the reader can use for more information. For news related to promotions, retirements or important changes of command, fill out the On the Move form and submit. NOTE: With exceptions (e.g., awards), all On The Move submissions should be relevant news items regarding officers at the 0-5 level who are program, project or product managers, or relevant news items regarding officers 0-6 and above and enlisted Soldiers E-8 and above. To showcase the professionalism and accomplishments of the workforce as well as the range of career opportunities in Army acquisition, fill out the nomination form and submit. NOTE: Nominees must be current on all DAWIA certifications and requirements or within the allotted grace period. We welcome your stories, ideas, opinions and art (photos, graphics, etc.). We will do our best to provide a timely response to your submissions. Rationalizing Army data and defining the acquisition data domain. For any given issue and any given field, somebody owns that data, so how do we break down those stovepipes? Using data to inform good decision-making. Interagency, joint and international partnerships are a focus of Army planning. Partnerships with academia are important to getting advanced technology faster. We must improve our efforts and make research grants that actually enable real research, from which the Army retains the intellectual property rights. Partnerships with nontraditional defense industry are critical to understanding what the newest technology can do to benefit the Soldier. Interoperability is key to the Army Vision—it is critical that the U.S. stands side-by-side with allies and partners to maintain overmatch and increase lethality against future threats. We must get over our over-reliance on 12-pound iPads. Not everything needs to be milspec. Requirements evolution as a result of technology integration analysis. Role of technical standards in system interoperability. Integration opportunities resulting from technology maturation. Themes are subject to change at biannual Army AL&T Editorial Advisory Board meetings. Cultural Change. To effectively modernize the force, ASA(ALT) will be assertive, flexible, adaptable and forward-thinking. While process is important, delivering product is the fundamental standard by which success is measured. Work closely with cross-functional teams to define, establish and write requirements. Maximize use of law and policy to rapidly prototype, produce and field products. Accelerated Fielding. Ensure an agile and responsive acquisition system to meet the needs of our Soldiers. Reduce time-consuming and wasteful processes and reports. Focus efforts on developing an acceptable materiel solution and fielding that product; allow for time to upgrade the fielded system incrementally over time. Accelerated Technology. Apply resources to employ and develop technologies that provide the greatest military advantage. Ensure that the Army intelligently focuses its science and technology investments on those technologies that contribute to the greatest advancements toward modernization and to enable technologies. Accountability. Improve the way business gets done to make the Total Army more lethal, capable and efficient. Ensure that organizations, policies, processes and tasks that consume time, money and manpower deliver real value.